What You Can Do to Protect Our Water! There was widespread concern in the environmental community that the Minnesota Legislature would spend the 2017 legislative session putting our water, air, and public health at risk. The Republican leadership, newly in control, confirmed our worst fears. Extreme partisanship and secretive, behind-closed-doors decision making got in the way of commonsense progress to protect Minnesotan’s health and environment. A special session was called when the same behavior inhibited the legislature and Governor Dayton from agreeing on the State’s budget. In order to avoid a government shutdown, the budget was passed despite containing many unpopular policies. Removes consumer protections for some utility ratepayers who choose to invest in solar or wind. Allows the legislature to interfere with proposed Renewable Development Fund projects. Exempts small utilities from Minnesota’s Conservation Improvement Program. Preempts local government from enacting ordinances that ban the use of plastic bags and voids existing ordinances that regulate plastic bags. Allows polluters to write their own draft Environmental Impact Statement (EIS), shielding information used to prepare it from public disclosure. Limits the right for Minnesotans to contest a mining permit. Exempts cities that construct public water treatment facilities from having to make technological updates to comply with clean water standards for 16 years. This victory was included in the Omnibus Education Finance Bill after months of grassroots action. Until now, there has been no requirement for lead testing in schools. The new law requires a comprehensive plan for lead testing in each school by July 1, 2018. It also requires that the water be tested at least once every five years and parental notification of results. Clean Water Action advocated for Governor Dayton’s recommendation of $172 million for wastewater, drinking water, and stormwater infrastructure needs. The legislature passed a bonding bill that includes $116 million in funding: $40 million is dedicated to wastewater treatment infrastructure; $15 million for drinking water infrastructure; and $33.7 million for the Point Source Implementation Grant Program. The Capital Bonding bill included $25.4 million in funding needed to obtain $47.2 million in federal funds as part of the multi-state and federal effort to clean up the Great Lakes. A University of Minnesota research program focused on developing new cover and perennial crops to improve soil health and water quality. Forever Green received $1.5 million in funding over the next 2 years from the Legacy Amendment’s Clean Water Fund. This bill would have established a moratorium on the use of waste tire as ground cover on playgrounds and as infill on athletic turf fields until the latest research on health effects could be analyzed. It would have also required signage that educates users on ways to reduce their exposure to toxic chemicals. This bill would have protected children and firefighters by expanding the number of toxic flame retardants banned in Minnesota from use in upholstered furniture and children’s products. This bill would have required manufacturers of both consumer and industrial cleaning products to disclose a subset of the ingredients in their products on the label and all of the ingredients on their website, so that consumers can protect their health from toxic chemicals and make informed decisions. Overall this session, the legislature did take steps to improve water quality and protect drinking water for children across Minnesota but they took too many steps backward on key environmental protections. There is still a lot to be done to put the health and well-being of our communities first. Now that session is over, it’s time to hold legislators accountable for the decisions they made and urge them to make these issues a priority when they return to St. Paul for the 2018 legislative session. On April 19th, more than 1,000 Minnesotans gathered at the state capitol for Water Action Day to lobby their lawmakers and advocate for the protection of Minnesota’s waters. Clean Water Action and member volunteers joined activists from dozens of other Minnesota environmental and conservation organizations. Constituents met with their legislators throughout the day to pose questions and voice their concerns about water quality and other environmental issues. People from all over the state were in attendance, including many from Greater Minnesota who had traveled by chartered bus. Only two districts out of 67 were not represented. 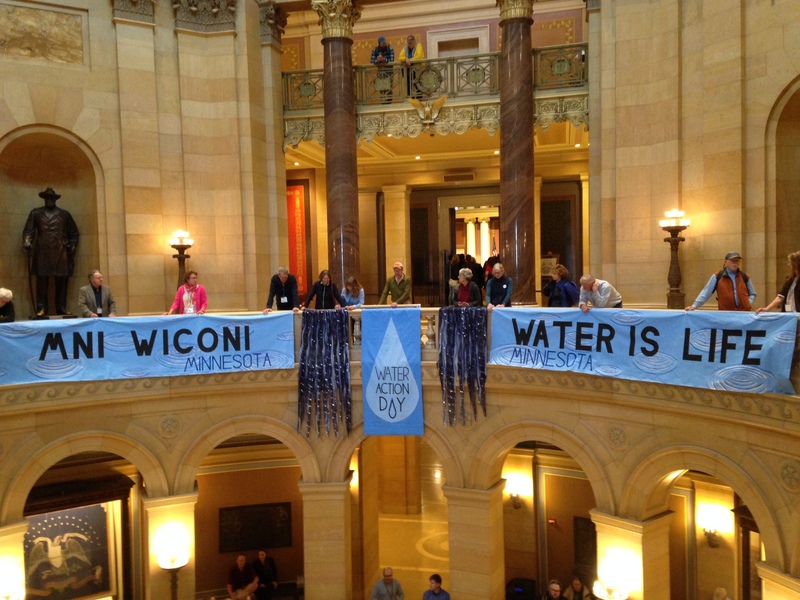 Participants of Water Action Day rallied at the rotunda of the capitol. Banners emblazoned with the Lakota words “Mni Wiconi” and its English translation “Water is Life” hung from the second floor mezzanine and people with hand-crafted signs encircled the rotunda several stories above the stage. Among the speakers were Governor Dayton and activist and environmentalist Winona LaDuke. Shortly before the rally, Governor Dayton met with more than 50 young people to hear their concerns about water pollution, agricultural runoff, sulfide mining, and the construction of the Enbridge Line 3 pipeline among other environmental issues. The outpouring of support for, and enthusiasm in, Water Action Day at the capitol will likely make it an annual event, especially if the legislative leaders continue to attack our clean water protection as they have thus far this year. When consumers organize, companies change! While we are playing a lot of defense in the public sector, consumers and advocates are winning big in the private sector as a result of market campaigns. Market campaigns leverage consumer power to win changes in corporate policies and practices. Clean Water Action is part of several national market campaigns, such as Mind the Store and Getting Ready for Baby, that share the common goal of protecting public health and the environment by getting toxic chemicals off store shelves. Since the Mind the Store campaign’s start in 2013, four of the nation’s top ten retailers have made significant commitments to get toxic chemicals out of their supply chain. Minnesota based Target adopted a chemical policy that includes bans on toxic chemicals like formaldehyde, phthalates, and perflorinated chemicals. Best Buy, headquartered in Richfield, also committed to enact a chemical policy by the end of the year. Prior to this campaign, not a single retailer had a comprehensive chemical policy in place. These advances can continue as consumers challenge other leading retailers to respond to demands for safe products. At Costco’s recent shareholder meeting, consumers called on the company to protect shoppers’ safety from toxic chemicals. More than 35,000 consumer comments collected here in Minnesota and across the country were delivered. While Costco has yet to act, other major retailers like Walmart and CVS are tackling toxic chemicals in their supply chains by adopting innovative policies. These new policies are a win not only for public health and the environment but also for the sustainability of companies. 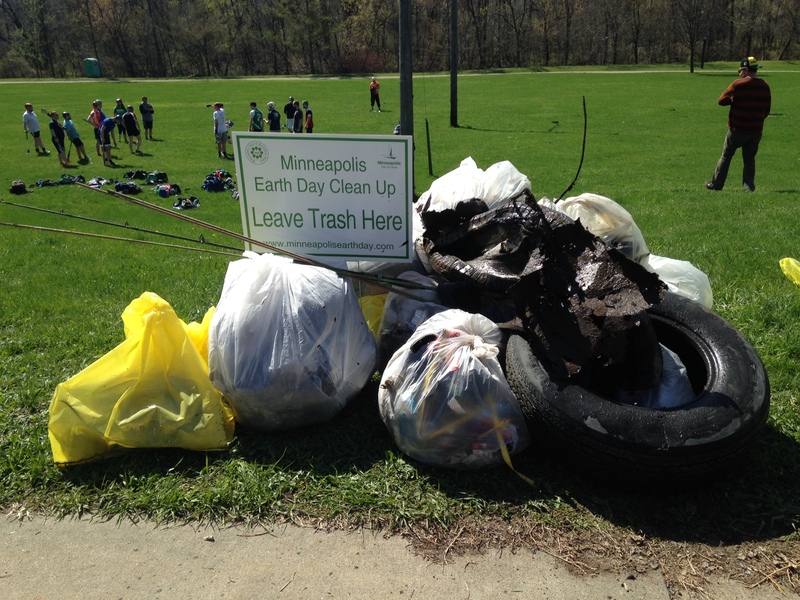 Earth Day 2017 was a busy day for staff and supporters of Clean Water Action who gathered in the morning along the banks of Bassett Creek as part of an annual Earth Day Clean Up event at Bassett Creek Park. Thanks to these efforts, dozens of bags of trash and recyclables were collected and disposed of properly. Later that day, many Clean Water Action staff and members joined with thousands more in St. Paul for the Science March. City streets and the mall were full of Minnesotans who recognize the important role that science plays in protecting the environment and public health. It was inspiring to see such an outpouring of support on this important issue. Clean Water Action is committed to working with scientists and science-lovers to ensure that objective scientific research is valued and is used to develop and enforce environmental protections. What You Can Do this Summer to Protect Our Water! Summer is here! In Minnesota, it is a time for hot, increasingly humid weather, and enjoying lakes, rivers, and streams to have fun and to cool down. It is also a time to think more about water and its connections to daily lives. Sometimes it might seem like there is not much that individuals can do to protect the health and vitality of Minnesota’s water because these problems seem too big. Increasingly though, everyone has a shared responsibility to do their part to protect water. How we use water at home, what happens to the rainwater falling in the yard, and what gets sent down the drain are all challenges that everyone should take responsibility for addressing. Conserve electricity. The largest use of water in Minnesota is for energy production. Turn off water when brushing your teeth and shaving. Use low-flow showerheads and take shorter showers. Use low-flow aerators on the faucets in your house. Only wash a full load of dishes and clothes. Don’t pre-wash dishes but do scrape off large pieces of food. Modern dishwashers tend to use less water per load than washing by hand. Store filtered tap water in a pitcher in the fridge instead of drinking bottled water. Use green cleaning products that are safer for our waters as well as our families. Many of the most common cleaning chemicals have safer and less expensive alternatives. Don’t dispose of household hazardous waste down the drain, in the storm drains or on the driveway. These include solvents, pesticides and paint. Contact your county to find your local hazardous waste disposal options. Don’t dispose of medications down the drain. Instead, refer to the current Minnesota Pollution Control Agency guidelines for disposal of unused medications or contact your county sheriff. Avoid watering your lawn except under severe drought conditions. Cool season grasses may turn brown and go dormant in the middle of the summer but will re-grow when rain and cooler weather returns. Mow less. The longer your grass is the less water it needs to stay healthy, especially in drought conditions. It will also help cut down on Air Quality Alerts in the cities. Use native plants appropriate for your area and plants that require a low water input. Native plants often require considerably fewer fertilizers and pesticides and less maintenance. Harvest and keep rainwater on your site by using rain barrels, rain gardens, and permeable paving. Rains in urban areas wash over hard surfaces, moving large volumes of water, sediment, and pollution to sewers and nearby lakes, rivers, and streams. Avoid leaving any yard waste and leaves in the street gutters, storm drains, or your driveway. This waste will eventually end up untreated in our waterways and increase nutrients in our lakes that leads to more algae blooms. Either dispose of yard waste as directed by your county or city or use the waste as compost or mulch. And make sure you sweep the street gutters and your driveway after mowing. Other landscaping tips can be found at the University of Minnesota Extension Service. Thanks to everyone who turned out on June 6 for Clean Water Action night at the movies. More than 60 people turned out for a special showing of Josh Fox’s “How to Let Go of the World...and Love All of the Things that Climate Can’t Change” followed by a great discussion. Special thanks to event sponsor Seventh Generation for their support of this annual event.